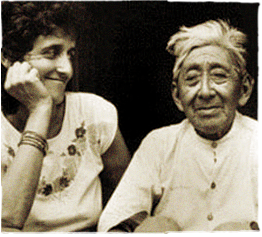 In 1983, Chicago native Rosita Arvigo, a doctor of Naprapathy (D.N.) began an intensive 12 year apprenticeship with one of the last living Maya shamans in Central America. Don Elijio Panti was already 90 years old when Arvigo began to study with him in his tiny, remote village of San Antonio in Western Belize, not far from the Guatemalan border. Rosita learned about native healing plants, the Maya prayers, herbal bathing for physical and spiritual healing and the ancient technique of Maya abdominal massage, known simply as “la sobada” – the massage. She watched her mentor’s deft and wrinkled hands massage thousands of abdomens with incredibly impressive results. Maya women often arrived on the doorstep of this humble clinic in groves and gaggles to have the old bush doctor massage their abdomens for relief of painful periods, headaches, tired legs, infertility and digestive upsets. So impressed with the technique and its deeply healing results, Arvigo spent a decade researching the how’s and why’s of this Maya Massage System. She applied her knowledge of anatomy, physiology, herbology and her naprapathic training in damaged ligaments to establish a credible explanation of causes, signs, symptoms and successful treatments for both men and women. Don Elijio passed away in 1996 at the age of 103. Rosita also studied with many local midwives, including Miss Hortence Robinson, a 73 year old herbal midwife of Belize who had been delivering babies since she was 13. Midwives and healers of Central America agree that most female troubles are caused by the wandering womb.